If you're looking for an easy way to chop veggies, you're sure to fall in love with the Vidalia Chop Wizard. This small, inexpensive kitchen gadget greatly simplifies the process of cutting fresh veggies into small, even chunks quickly, efficiently and safely. Do you find preparing vegetables to be tedious? I know that I do. I have actually talked myself in to purchasing pre-cut veggies in the supermarket for double the price of their whole counterparts, just to keep from having to chop them myself. Now that I have tried the Vidalia Chop Wizard, though, I'll never go that route again. There's no reason to do so - not when you have one of these handy devices in your kitchen! This device could not be any easier to use. 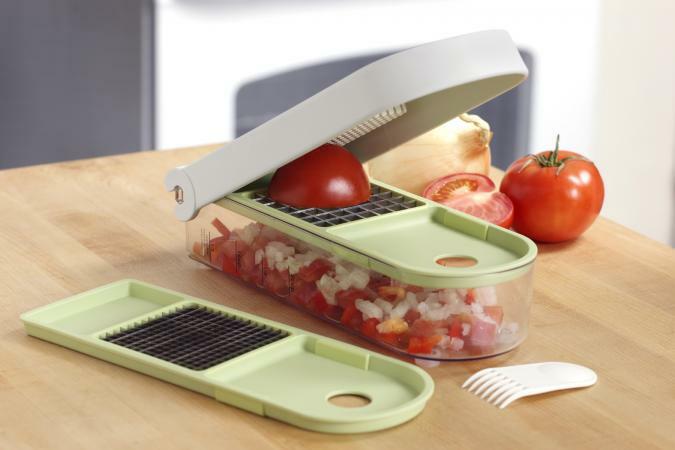 It comes with a base compartment that serves double-duty as a measuring cup, two interchangeable blades (one that chops and one that dices) and a functional lid that forces the veggie you are cutting through the blade into the base. Simply place the blade of your choice on the base, place the vegetable you want to chop on the blade and close the lid. You'll end up with perfectly shaped chunks as soon as you shut the lid. That's it. There is nothing else to it. The first time I used it, I diced a cucumber for my favorite Tzatziki Sauce recipe. It made easy work of cutting up the cucumber into tiny pieces, which is ideal for this recipe. I will use it every time I prepare this dish, as well as for other recipes that call for finely chopped fresh veggies. The gadget assembles quickly and easily and comes apart with virtually no effort. It's not even difficult to clean, as each piece can be safely washed in the dishwasher. What could be easier than that? Note: The author received a free sample of this item in order to conduct this product review. The opinions presented here are her own.